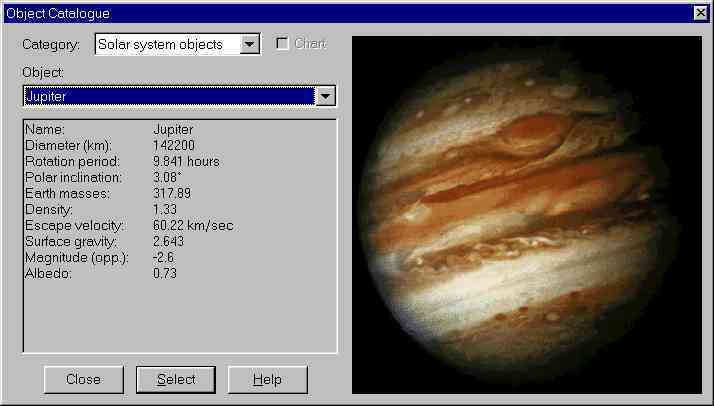 Release 3.3a of Home Planet, a comprehensive astronomy / space / satellite-tracking package for Microsoft Windows 95/98/Me and Windows NT 4.0/2000/XP and above, is now available; see details at the end on how to download and install the software. Release 3.3a of Home Planet is a native 32-bit Windows application which cannot be used on Windows 3.1; if you have such a system, download Home Planet Release 2, which remains available. Home Planet is in the public domain; it is free software. It is not shareware—you don't have to register it or pay anybody anything, and the version you download is fully functional as soon as you install it. You are free to give copies to your friends, post it on other sites, and otherwise use and distribute it in any way without permission, restriction, attribution, or compensation of any kind. Panel showing positions of planets and a selected asteroid or comet, both geocentric and from the observer's location. Chart catalogues, selectable from within the Object Catalogue, can be plotted in all sky view windows (Sky, Telescope, and Horizon). Objects are specified by right ascension and declination, and can use any of the star, deep-sky, satellite, or user-extensible scenery icons, plus text (in various colours) with user-defined justification. Commands allow plotting straight lines and lines which curve along parallels of latitude. Chart catalogues are included which display chart boundaries and numbers of Sky Atlas 2000.0, and radio sources from the Third Cambridge Survey (3C) cross-identified with the 4C survey. Orrery allows viewing the solar system, including a selected asteroid or comet, from any vantage point in space, in a variety of projections. Satellite tracking panel. Select an Earth satellite from a database of two-line elements, and see its current position and altitude. Satellite will be shown as an icon on Earth map, Sky, Telescope, and Horizon windows. 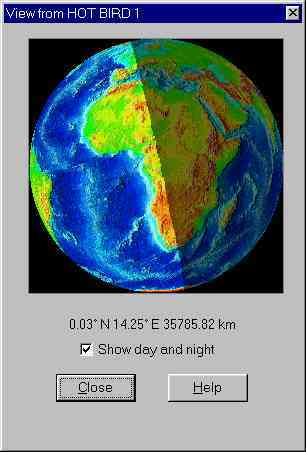 View Earth From panel allows you to view a texture-mapped image of the Earth as seen from the Sun, Moon, a selected Earth satellite, above the observing location, or the antisolar point. For a real thrill, fly Molniya through perigee! Satellite database selection allows maintenance of multiple lists of satellites, for example TV broadcast, ham radio, low orbit, etc. 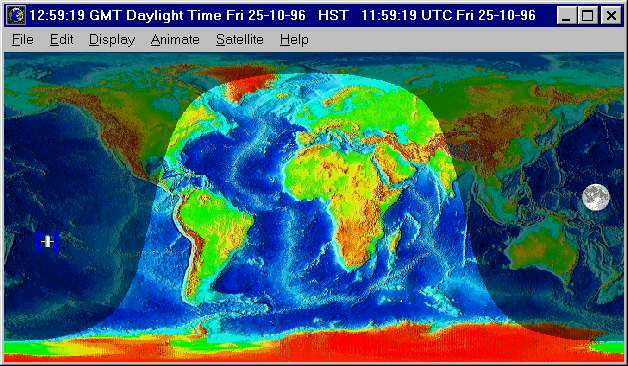 DDE server permits export of real-time Sun, Earth, and Moon information to any DDE client. A sample Excel worksheet is included. Computerised telescope pointing is supported via DDE. When the Telescope window is pointed at a given location in the sky, its coordinates are exported via DDE (in both Right Ascension and Declination and Altitude and Azimuth), permitting a concurrently running telescope drive program to direct a physical telescope to the given location. The sample Excel spreadsheet displays the telescope pointing coordinates. Observing site selection lets you choose a site from a database of more than 1300 cities and towns, or by clicking on the world map. Animation lets you put the heavens into higher gear, with selectable speed, time direction, and time step. Demonstrate seasonal changes, Moon phases, satellite orbits, precession, proper motion, etc. Time and date can be set to any moment from 4713 B.C. into the distant future. Examples of historical research are included. Planetary position calculations use the high-precision VSOP87 theory, and lunar position is calculated with the revised ELP-2000/82 lunar theory. Calculation of dynamical time, obliquity of the ecliptic, nutation, precession, and aberration all use high precision algorithms. Cuckoo clock. Hey, I live in Switzerland! You can turn it off. A comprehensive WinHelp file is included, describing not only the program but the astronomical concepts that underlie it and how to learn more about astronomy. Complete program development log included in WinHelp format, accessible from main Help file. An optional screen saver that shows the illuminated Earth and position and phase of the Moon is included. Home Planet was built entirely from source code using Microsoft Visual C++ .NET bought directly from an authorised Microsoft reseller. Home Planet Release 3.3a is supplied in two editions. The “Lite” edition is intended for users who wish to evaluate the program and for casual users. It includes all of the functionality described above and has no accuracy or feature limitations, but in order to reduce download time, contains smaller databases (for example, only the brightest 7000 stars instead of 256,000, and a 720×360 pixel map of the Earth rather than one with higher resolution. The Lite edition does not include the collection of images of astronomical objects present in the full version. The Lite edition is less than 1.6 megabytes in size. The “Full” version of Home Planet includes everything in the Lite edition, plus the larger databases, images, and sound files, which increase the size of the download to more than 13 megabytes—more than many people are comfortable downloading on dial-up connections. If you've downloaded the Lite edition and later wish to upgrade to the Full package, there is a Home Planet upgrade kit available which contains only the components of the Full package omitted from the Lite edition. At the risk of being repetitious, I'll give separate instructions for installing both Lite and Full editions, as well as the Upgrade Pack. Once Home Planet is installed, you can launch the application simply by typing HomePlanet from the MS-DOS prompt while in its directory, or by using the Run item on the Start menu and entering c:\hplanet\HomePlanet as the program name. Obviously, if you used a different drive or directory name instead of “c:\hplanet”, you would enter that name. For convenience, create a shortcut icon that points to Home Planet, and you'll be able to launch Home Planet simply by double clicking it. (The “o” option on unzip instructs it to replace existing files from the Lite edition with their counterparts from the Full release without asking whether it's OK to overwrite the old files.) Once the upgrade is installed, launch Home Planet as you did before. You will see new objects and images in the Object Catalogue, additional selections on the Display/Map Image menu item in the Map window and the Display/Star catalogue item in the Sky window. A screen saver which displays the the Earth map with day and night regions and the current position and phase of the Moon like Home Planet's main Map window is available. It used to be included with Home Planet, but has been broken out into a separate package to reduce download time for Home Planet users who have no interest in the screen saver. To obtain the screen saver, first download it. When the download is complete, you will have a “zip” compressed archive named hp3ssave.zip. Use Info-ZIP or a compatible utility to extract the file HomePlanet.scr into the directory on your system where screen savers are kept. On Windows XP this is c:\windows\system32, on Windows 95 and 98 it is c:\windows\system and on Windows NT c:\winnt\system32. If you've installed your operating system on a different drive and/or directory, use the location where the system's *.scr files are found. Once the screen saver is extracted into the system directory, use the “Display” item in the Control Panel to select the screen saver. The only configuration parameter is whether the Moon is displayed on the map. In August of 2006 the screen saver was updated to use the NASA natural colour cloudless Earth map. If you prefer the original topographic map, or the current version of the screen saver refuses to run on older systems such as Windows 95 and 98, you may continue to download the original release. Experienced C programmers who wish to modify Home Planet or simply look under the hood to see how it works may download the source code. You're welcome to use this source code in any way you like, but it is absolutely unsupported—you are entirely on your own. Note that the bitmaps included in the source code archive are reduced resolution and colour gamut images prepared expressly for Home Planet. If you're looking for cloudless Earth images for other applications, you're better off starting with the higher resolution, 24 bit per pixel images available from the NASA Earth Observatory site.